Our local equestrian community lost a very wonderful person on December 7, 2014 when Caroline Pinkers, born Caroline Nichols, passed away. Caroline was born on January 1st, 1931 and began to ride at Hutchinson Farms in Scarsdale, New York. Soon, she was a Riding Counselor at Summer Camp. In 1949, she received her Equitation Certificate from Southern Seminary, Buena Vista, West Virginia. She often rode in regional hunts. Caroline married Lothar Pinkers in 1954. She first worked at Washington University Library, then as the department secretary for the Bacteriology Department at Washington University Dental School in St. Louis, Missouri. Caroline went on to work as a Record Librarian at St. Luke’s Hospital. Lothar’s medical internship took the young couple to Colorado, where Caroline worked at St. Anthony’s Hospital outside of Denver. When Lothar was made chief of the Denver Federal Center Health Clinic in 1957, they started a family. Lothar’s residency at Virginia Mason Medical Center brought the family to Seattle. Their family grew to include four children – son Arthur and daughters Beth, Christie, and Diane. Caroline enjoyed being a stay-at-home mother during this time. In 1983, the family added a horse — Get’s Spellbinder was purchased for daughter Diane and a “horse show mother” was born! Not too long after this, Caroline and Lothar attended a meeting of the Lake Washington Saddle Club where the president announced that the annual Hunter/Jumper show would have to be suspended because of lack of volunteers. 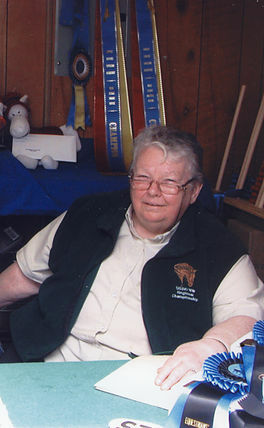 She and Lothar looked at each other and said, “We can do that!” Caroline was very active in the local Hunter/Jumper community from 1989 to 1994 as the Show Secretary for Lake Washington Saddle Club’s annual Hunter/Jumper shows. From 1998 through 2010, Caroline and Lothar worked with Equestrians Institute and the USDF Region 6 Championships. She ran the Awards Desk and was a driving force behind the scenes for many E.I. shows over the years. Caroline was ingenious in the show office – one of her brilliant innovations was a paper system to devise the complicated ride schedule for multiple show rings over multiple day dressage shows. With the best cursive penmanship around, she wrote instructions for everyone to follow when she started handing off some of her duties to other volunteers. Caroline took special care of the award ribbons; she organized them beautifully, wanting each ribbon to hang straight and smooth on the peg-board. She was a perfectionist and a very hard worker, devoting many months each year to putting on these wonderful shows. 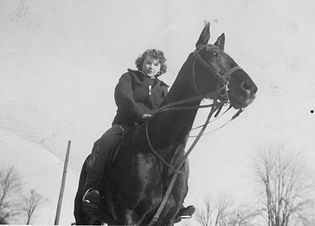 Caroline was also very active with the Washington State Horse Council from 1987 until 1999, and was the treasurer for many years as well as the unpaid “office staff “during that time. She actively lobbied for the Limit of Liability Statute for horsemen and also lobbied for the legislation that established the Washington State Horse Park, which is now a success in Cle Elum, Washington. Caroline Pinkers was a driving force in the horse community and her passion and volunteerism has benefited equestrians in Region 6 and beyond. She will be greatly missed. Caroline’s favorite charity was the Washington State Horse Park, and her friends suggested that a memorial gift there would keep her spirit alive. 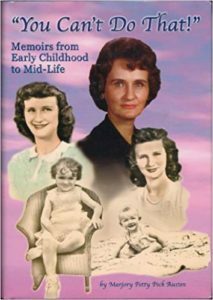 Marjory Peck Austen, formerly of Ashland and Shreve, died in Texas on Dec. 31, 2009. She was born on Dec. 26, 1932, to Alva M. and Lela V. Petty in Somerset. Marjory graduated from Ashland High School in 1950. She also graduated with honors from Ashland College in 1967 and went on to attain a master’s degree in music therapy from the University of Akron in 1975. She began her teaching career in the Loudonville-Perrysville School District, where she was employed as a music teacher and choir director. Marjory later became a superintendent of schools in Seneca County, Ohio, as well as Houston, Texas, from which she retired. She married Thomas Austen on Jan. 1, 1977. He survives in Porter, Texas. She is survived locally by her children, William (Julia) Peck of Perrysville, Marcia (Fred) Hosfeld and Laura (David) Preston, both of Wooster; six stepchildren; eight grandchildren; seven great-grandchildren; a step-great-grandchild, as well as two nieces and a nephew of the Perrysville area. She was preceded by her parents; a son Robert; and two brothers. At her request, her body has been donated to medical science. Memorial contributions may be made by mail to: Arthritis Foundation, Northeastern Ohio Chapter, 4630 Richmond Road, Suite 240, Cleveland, OH 44128. A memorial service will be planned for a later date at the convenience of the family. It’s unfortunate that we sometimes get so involved in our work and lives that we forget to “keep up” with loved ones and associates. Thank heavens for the internet, where we can go when we are reminded of these important people and wonder what’s become of them. We haven’t forgotten you, Caroline and Marge. In the future, I want to post memories of other folks instrumental in my life, especially as they have added to my love of family history.